Parasitoid wasps of the family Braconidae are known for their deadly reproductive habits. Most of the representatives of this group have their eggs developing in other insects and their larvae, eventually killing the respective host, or in some cases immobilizing it or causing its sterility. 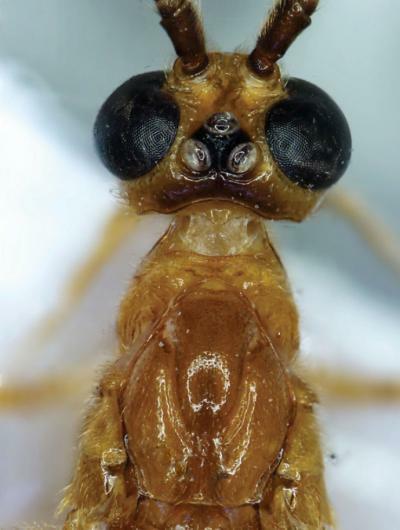 Three new species of the parasitoid wasp genus Cystomastacoides, recently described in the Journal of Hymenoptera Research, reflect this fatal behavior. Two of the new species were discovered in Papua New Guinea, while the third one comes from Thailand. The Thai species, Cystomastacoides kiddo, was named after the character Beatrix Kiddo in Quentin Tarantino's 'Kill Bill' films. The deadly biology of the wasp inspired this reference to the protagonist played by Uma Thurman, where she embodies a deadly assassin and a master of the Tiger/Crane style of kung fu. She is a master of the "Five Point Palm Exploding Heart Technique", a method of killing a person by quickly striking five pressure points around the heart with the fingertips. After the victim takes five steps, the heart explodes and the person falls dead. This image show a close up of Cystomastacoides kiddo, named after Beatrix Kiddo, a protagonist from Tarantino's "Kill Bill." The macabre in the name of one of the new species from Papua New Guinea references back to another strand of contemporary pop culture: Cystomastacoides nicolepeelerae is named after Nicole Peeler, the favourite novelist of Donald Quicke, the lead author of this article. Peeler's writing deals with murder mystery, dark powers, the subconscious and the supernatural. 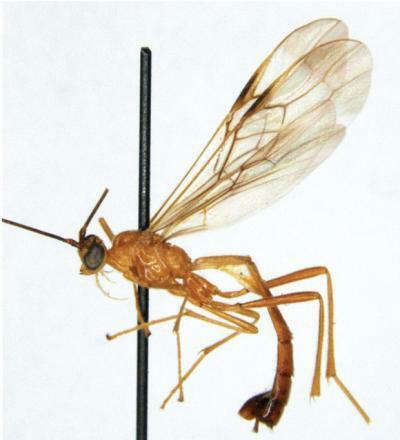 The name of the third species, Cystomastacoides asotaphaga, also from Papua New Guinea, lacks the popular culture element but still brings up the deadly survival techniques of the wasps described. In translation, it means feeding on Asota, described genus of moths whose caterpillar is eaten from the inside by the wasp's larva and thus eventually killed. Asota plana is the first host record for the genus to which the new species belong. It is a widespread moth species known to feed on multiple fig tree (Ficus) species. With three new species from Papua New Guinea and Thailand, this paper also extends the known range of the genus considerably. 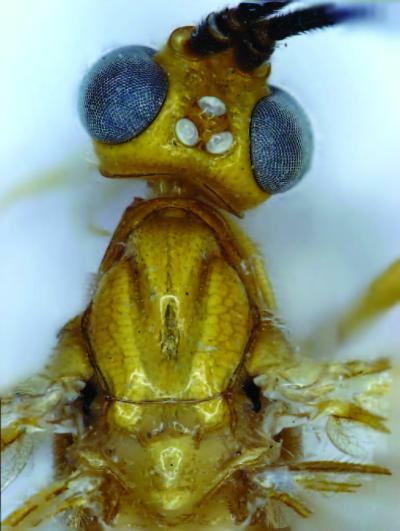 Previously, Cystomastacoides had been known only from a single species, Cystomastacoides coxalis, which was found only in mainland China (Yunnan). This picture shows, Cystomastacoides nicolepeelerae, named after the lead author's favorite novelist Nicole Peeler. This picture shows, Cystomastacoides asotaphaga, which means feeding on the moth genus Asota.